Colin and Darcy’s love affair with the West Coast is almost as old as their love affair with each other. Both born and raised in British Columbia, they set off for Alberta at the age of 19. The West Coast always held a special place in their hearts (especially Darcy’s, who would drive up and down the Old Island Highway declaring to anyone who would listen that “one day this would be the road that takes me to my home”), and so after 31 years in Alberta, Colin and Darcy made Fanny Bay home in September 2014. Their residence is right next to Tall Cedars so they are on site to help with any questions, directions, and dinner ideas, and love to share their knowledge of this place they now call home. Colin and Darcy love the land, the neighbourhood, community and all that Vancouver Island has to offer. It is a dream come true to be here and they look forward to sharing their enthusiasm with you. Tall Cedars is located in a quiet, adult oriented residential neighbourhood. If you are looking to get away from it all & relax in peace and quiet, this is your place. Fanny Bay is centrally located between Parksville and Qualicum to the south, Courtenay and Comox to the north. Within one hour either way you can find yourself skiing, golfing ,enjoying the many local artisans, roadside stands for fresh produce, eggs and seafood, or one of the many wonderful restaurants & pubs. Walking trails are easily accessible from right outside the door, or go for a swim or kayak. Upper level bathroom features a tub/shower combination. Quality bath products as well as toilet paper/tissue are supplied. 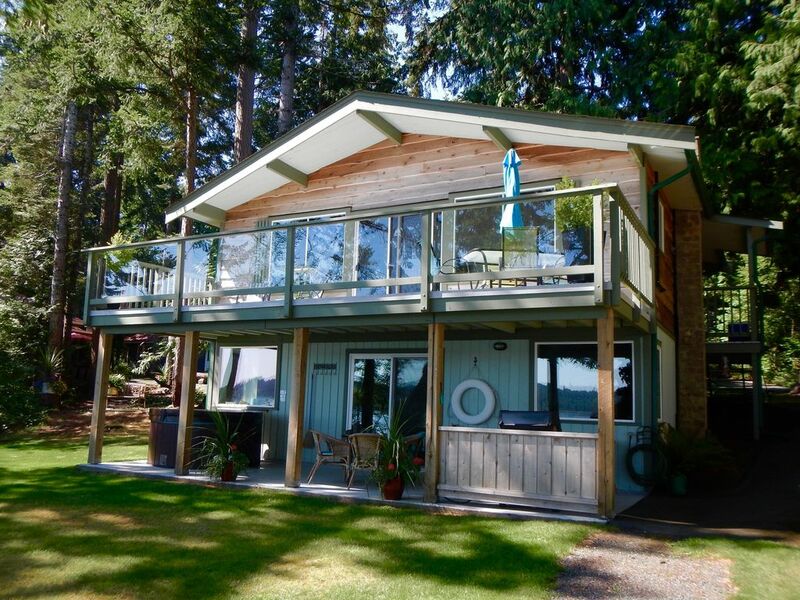 Tall Cedars is located right on the ocean front, shale/rock beach . No sand. Swimming with proper footwear. Towels are provided for beach/hot tub use. A small selection of spices, salt & pepper, sugar are provided. Kitchen is fully equipped with high quality items. Plastic glasses are provided for use in the hot tub. Fully equipped with high quality items. Dining table indoor and out with seating for 6. Basic Shaw cable package. Netflix provided. A nice selection of books on the area and Vancouver Island are for guest's use as well as a selection of magazines . Tall Cedars is in Fanny Bay, which is centrally located between Parksville and Qualicum to the south, and Comox and Courtenay to the north. Home to many local artisans, walking & biking trails, fabulous restaurants, golf courses, there is no end to the possibilities. Gorgeous view, peaceful, relaxing. All the amenities, including home baked cookies. Loved the hot tub, walks on the beach and watching the seals. Thank you! Glad you all had a great time. Hope to see you again next year for your girls getaway. What a beautiful serene place. The cabin was very clean, warm and welcoming. We enjoyed the hot tub and the owners Darcy and Colin were so helpful with insider tips on restaurants, and places to see. We would like to visit again! Thank you Susan and Jim for being perfect guests ! It was so nice to have two weeks to really get a feel for this island way of life. I know the snow sure wasn't welcome as you were trying to get away from snow, but at least it was warmer than home. We were happy to help with ideas on what to do. One can waste a lot of time with trial and error and we want you to get right to the fun. We pride ourselves on providing lots of information for our guests before your arrival and while you are here. We want people to know Tall Cedars is a perfect mid winter getaway . We welcome inquiries re: long term stays during the low season. Hope to see you both again! Peaceful, well maintained and extremely comfortable. Thanks to Darcy and Colin for sharing their absolutely perfect getaway for our family over Christmas. I am writing this at the kitchen table where we watched sea lions swim by less than 50 meters away. Darcy and Colin go to great lengths to make sure your stay is as comfortable and stress free as possible. I would wholeheartedly recommend this property to anyone that is considered coming to this part of the island. The house is situated in a small isolated seaside residential community but is only 20 minutes from all the supplies and services you would ever need in The Comox Valley. And being able to fly direct from Calgary into the Comox Airport just makes it all the the much better. Awesome! Thank for the great review ! We loved having your family at Tall Cedars for the holidays. Some of our favourite vacations as a family have been when we rented a home away from home. It was a pleasure to decorate the house for you, the beach themed tree was fun to create. We really appreciate you took advantage of the wonderful local food, the Butchers Block for your prime rib, and Just Like Mom's bakery for your baked goods. Always nice to support the local community. Your family is welcome back anytime. You are always welcome back , not only for your annual quilting retreat, but anytime at all. Thank you for trusting us for your special getaway. With the stunning view, beach access and hot tub, clean and cozy accommodations, courteous and kind hosts, and all the little extras, Tall Cedars was just what we needed for a weekend mini vacation! We’ll be back. Thank you!! This wonderful review contains some of our favourite words that can be used to describe Tall Cedars. Words like stunning view, clean, cozy, courteous, kind and little extras. You and your friends were perfect guests ,and we would be happy to have to back anytime . We came up from Victoria for the weekend and were not disappointed! The place has everything you could possibly need and the space is well laid-out and very comfortable. The view and waterfront location were enough to make us forget all our troubles. Ahhhh, forgetting all your troubles. Yup, that's what we do best here at Tall Cedars. From the time you arrive you will feel a peace settle over you that only the sea can bring. The view is truly special and no matter what the weather, there is something magical about it. Thank you for your wonderful review, we work hard to provide everything you need to allow you to escape and just relax. Hope you can come back again ! Tall Cedars is located on a quiet, residential street well away from the main highway. The only sound you will hear is the birds,sea lions, an occasional fishing boat and your contented sighs .